Toss the sliced potatoes in a dish with the duck fat, reserving 2 tbsp. Season liberally with salt. Rub 2 baking sheets with a thin layer of the reserved duck fat. Arrange the potatoes onto the baking sheets in a single layer. Bake for 25-30 minutes, flipping fries and rotating pans halfway through cook time, until golden and crunchy. Meanwhile, whisk the mayo, mustard and Worcestershire together in a small bowl. Drizzle truffle oil, chopped rosemary salt, and pepper over top. Set aside. When the fries are removed from the oven, toss with truffle oil and season with the chopped roasted garlic, herbs and Rosemary Salt. 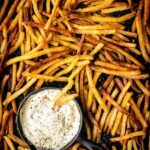 Allow fries to cool for a few minutes before serving with aioli.